Sometime back I read that on an average a person gains around 5 pounds of weight during the holiday season. I don’t know how accurate this is, but I can feel all my jeans and dresses getting tighter. Urghh 🙁 Seriously how easy it is to pile on rounds, if only it was that easy to lose them. I ate way too many desserts, like way too many! It’s time to pull up my socks and hit the gym. YES! How was your weekend? Fun? Relaxing? I just slept and slept some more. This rainy grey weather makes me want to curl up in my bed all the time. I can’t wait for summers! These days I only feel like eating simple homemade food. Simply because I ate out all the time during the holidays and so right now I am kind of fed up of the outside stuff. For me simple homemade food always includes dals (lentils), vegetable stir fry with roti, the good old Indian flatbread. Everyone loves potato in India, wait let me rephrase this sentence – potatoes are loved universally. Whether it’s baked potatoes, fries, wedges, hash browns or roasted the truth is we all need some potato love in our lives! 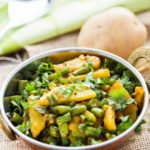 This potato and beans stir fry [popularly known as aloo beans, aloo=potato in Hindi] is super simple to make with minimal spices and ingredients. You know how I always say that I grew up eating vegan food without even realizing that it was vegan! The concept of Veganism has become hugely popular now but back then nobody knew about it in India and even then we ate Vegan food! Of course we had milk/yogurt in our diets so it wasn’t 100% vegan but our everyday meals of lentils, veggies and breads were all vegan. In a pan heat 1.5 tablespoons of oil on medium heat. Once the oil is hot, add cumin and mustard seeds and let them crackle. Once the seeds crackle add the chopped onion and curry leaves. Saute till onion becomes translucent, around 2 minutes. Add red chili powder, turmeric powder and dried mango powder (amchur) and mix. Cook the spices with the onion for a minute or two. Add the sliced potatoes next. 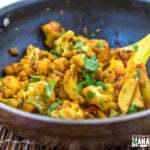 Mix the potatoes so that they are well coated with the onion and spice mixture. Cover the pan and let the potatoes cook on medium heat till slightly tender [but not completely cooked], around 2-3 minutes. I sliced the potatoes thinly and hence they cooked faster. Now add the chopped green beans, salt and mix. Cover and cook till beans are tender and done. The potatoes will also be completely cooked by now. Serve hot with roti. You can also eat it with naan, pita bread or paratha. * Cut the potatoes into thin slices. They cook faster that way. In a pan heat 1.5 tablespoons of oil on medium heat. Once the oil is hot, add cumin and mustard seeds and let them crackle. Add red chili powder, turmeric powder and dried mango powder (amchur) and mix. Cook the spices with the onion for a minute or two. Add the sliced potatoes next and mix so that they are well coated with the onion and spice mixture. Cover the pan and let the potatoes cook on medium heat till slightly tender [but not completely cooked], around 2-3 minutes. 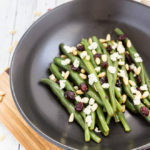 Now add the chopped green beans, salt and mix. Cover and cook till beans are tender and done. The potatoes will also be completely cooked by now. Garnish with chopped coriander leaves and serve immediately with naan or roti. So bright, healthy and colorful Manali! Pinned of course! Glad to hear I’m not alone Marcie! Yes no to desserts for sometime although considering how much I love to bake it will be very hard, like really hard! Seriously, I need all the (healthy) food I can get! Seriously. I love coming to your blog. It literally brightens my day. Your photos are so bright and colourful and so authentic. You have one of my favorite blogs Manali! Anyway, I need to get into more Indian food because this looks crazy delicious! I love this method of preparation of the potatoes. Jessica, you are way too kind! This really made my day especially coming from one of my favorite bloggers! Thank you so much Jessica, you need to try Indian food because it’s the hub of vegetarian and vegan food! Oh this looks so good! I have also been eating much simpler food recently. We ate varan bhaat and beans the other day which is like, the ultimate simple food (not sure if you’ve heard of it, but it’s basically just like yellow lentils and makes a really light daal and you squeeze lemon juice on it). 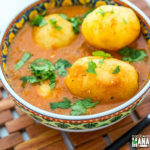 Indian simple comfort foods are the best! Yes I do know varan bhaat Karishma! 🙂 It’s like the ultimate comfort food…in Hindi we call it dal-chawal..same thing! I swear too much of junk I had..nowadays it’s only comfort food for me! 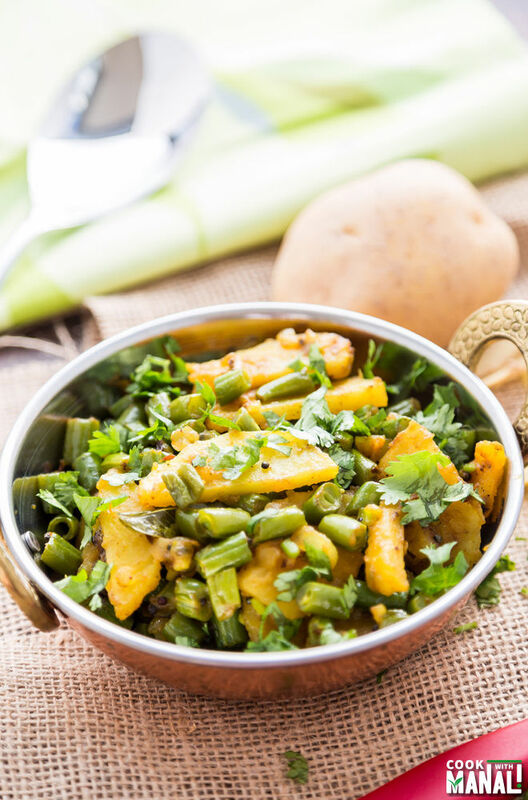 Love this Manali – the ingredients are right up my alley! I’ve never heard of Mango Powder before though! I’m wondering if it’s something I can get at my local grocery, or if I need to go to a specialty grocery store? I want to try this! I’m craving for more simple and homemade foods too after the holidays! Love this stir fry! It looks so flavorful and delicious! Thanks Kelly! Yes don’t feel like eating out these days! I can almost smell this through the screen. 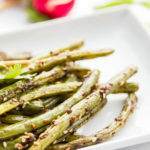 I need more inspiration for healthy side dishes, so keep them coming! Never have I seen dried mango powder before – curious to know what the addition tastes like. 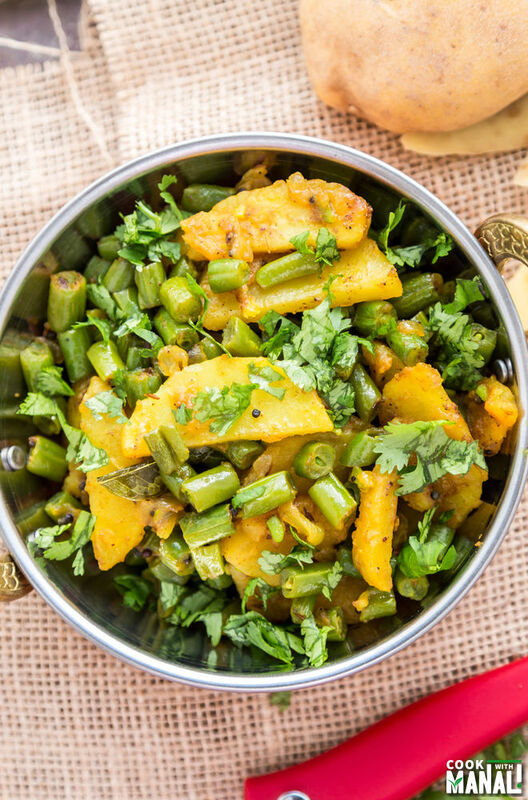 These aloo beans just look so flavoursome Manali! it gives a tangy flavor to the dish…you can add lemon juice in place!